The son of Don Hasselbeck, who played tight end in the NFL, Hasselbeck passed for 4548 yards and 22 touchdowns in college and was chosen by the Green Bay Packers in the sixth round of the 1998 NFL draft. He spent that year on the practice squad and then saw scant action behind QB Brett Favre in 1999 and 2000. Hasselbeck was traded to the Seahawks in 2001 and was mentored by veteran QB Trent Dilfer while also training under Head Coach Mike Holmgren, formerly of the Packers. With good size and arm strength, if not mobility, he developed into a Pro Bowl quarterback in 2003 when he threw for 3841 yards and 26 TDs and the team improved to 10-6 and reached the postseason. Hasselbeck followed up with a somewhat lesser year in 2004, passing for 3382 yards and 22 touchdowns while playing through injuries, but performed well down the stretch after an inconsistent start and earned a contract extension. Seahawks went 13-3 to finish first in the NFC West while leading the NFL in touchdowns (57) and scoring (452 points) and the conference in total yards (5915). Won NFC Divisional playoff over Washington Redskins (20-10) & NFC Championship over Carolina Panthers (34-14). Lost Super Bowl to Pittsburgh Steelers (21-10). 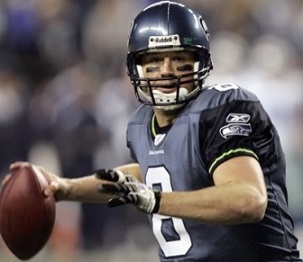 Hasselbeck suffered through a rough year in 2006, missing four games due to a knee injury. He bounced back in ’07 in achieving career highs with 562 pass attempts, 352 completions, 3966 yards, and 28 touchdowns and returned to the Pro Bowl. However, he appeared in only seven games in 2008 due to injury and endured lesser years in 2009 and ’10 before moving on to the Tennessee Titans and briefly resurrecting his career as he passed for 3571 yards and 18 touchdowns in 2011. Hasselbeck moved into a backup role in 2012 but started five games when second-year QB Jake Locker was injured. Released following the season, he signed with the Indianapolis Colts to provide a veteran backup to QB Andrew Luck and saw little action during the next two years until 2015, when Luck was injured and Hasselbeck started eight games, throwing for 1690 yards and 9 TDs in what proved to be his last season at age 40. Overall, Hasselbeck completed 60.5 percent of his passes for 36,638 yards and 212 touchdowns while giving up 153 interceptions. Of those totals, a team-record 29,434 yards along with 174 TDs and 128 interceptions came with the Seahawks. He added another 2741 yards and 18 touchdowns, with 9 interceptions, in 11 playoff games, all with Seattle. Hasselbeck was a first-team All-NFC selection once and was chosen to three Pro Bowls. His brother Tim also played quarterback in the NFL.